Are You missing out on Section 179 Tax Benefits generated when you purchase equipment? 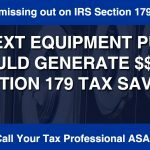 Are you taking advantage of the Section 179 Tax Deduction for purchasing laundry and other equipment for your business? Financing new equipment before the end of the year may allow you to keep more of your money through IRS Section 179 Tax Deductions. Consult your tax professional to find out how it can benefit you! Section 179 of the IRS tax code allows businesses to deduct the cost of certain types of equipment on their taxes. Professional laundry, garment care and other commercial equipment purchases may be eligible for Section 179 deductions. Ask your tax professional how Section 179 can work for your business. Don’t Wait Till Last Minute! Invest in your business today and improve your bottom line with eligible Section 179 deductions. Eastern Funding offers fast, hassle free financing for equipment. Whether you are looking to replace old equipment, outfit a new store or plant, our financing allows you to do more.